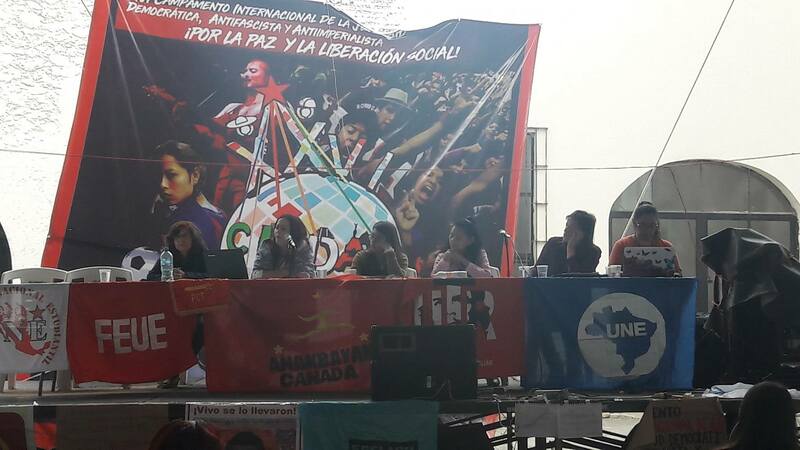 Amid intense inter-imperialist tensions, as a consequence of the weakened capitalist economy on a world scale; before the rise of fascist politicians, as well as the danger of war that every day threatens all the peoples of the world; youth gathered at the Autonomous University of Chapingo to raise their voices for their rights and for peace, against imperialism and fascism. The struggles that are being undertaken by youth from the Philippines, Hong Kong, Turkey, Argentina, Brazil, Peru, Ecuador, Dominican Republic, El Salvador, Canada, Puerto Rico, the United States; and from different corners of Mexico, young peasants, indigenous people, workers, women, students and from different popular sectors, we met at the XXVI International Antifascist and Anti-Imperialist Youth Camp, for 6 days. We formed panels, talks, workshops, and artistic activities. Together, we discussed the world reality, and we shared the struggles of the youth, the working class and the people of each of our countries. Through this process, we have confirmed that the youth have been one of the main victims of the atrocities of the imperialist system A system that intensifies the exploitation of the working class, deepens its fascist, racist and xenophobic drive, expels millions of young people from educational spaces, and condemns us to live in misery alongside our peoples. On the other hand, we have found that imperialist aggressiveness has discovered, in response, the mobilization and struggle of the workers, and peoples of the world. And, among them, youth has taken the front line of struggle. We, the young antifascists, anti-imperialists and democrats, who participated in these events, recognize that we are an important part of the struggles that are taking place in the world; and, that is why we assume that we will continue to raise the historical task of the working class, for its emancipation from of the capitalist yoke. To achieve this goal, to prevent war, to defeat the rise of fascism, and to accumulate forces for the radical transformation of society, the unity of all youth, peasant, student and popular workers is necessary. It is up to the youth to strengthen our organizations and the organizations of the workers and peoples. For peace and social liberation, let us raise the unity and struggle of youth!